I must confess that newsletters from the United Nations Development Programme in Turkey are not my usual bedtime reading. Yet I've been fascinated by its report on a study currently being conducted by a cross-border scientific team into the biodiversity of the UN buffer zone. Did you know that the buffer zone covers 3% of the island, and can be over 4 miles wide? Neither did I, so no wonder it's become a haven for wildlife. All the animals have to worry about are a few UN peacekeepers driving by, some low-key farming - and the odd land-mine, of course. The main beneficiaries of this peaceful existence are the mouflon, who can be found living in substantial numbers in the abandoned village of Variseia. 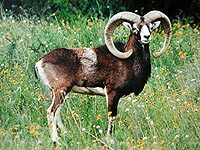 I've never seen one of the 3000 mouflon that live in the wild, but apparently in the buffer zone, they are a common sight. The scientists are also looking for some of Cyprus' other rare species, including the Cyprus tulip and the freshwater terrapin. After all, with no development, no hunting and no tourists permitted in the UN-monitored buffer zone, if I were an endangered terrapin, I'd be there as fast as my legs would carry me. However, there are signs of less welcome, human activity; illegal hunting traps have been found, along with rubbish tips and discarded pesticide containers. Even the buffer zone is not immune from progress. And here, of course, is the irony. When the whole north/south issue is resolved, (and note, I say when), what will happen to this unique wildlife corridor than spans Cyprus? One plan is to make it into a peace park, which seems a great idea to me. The park would give the united people of Cyprus a permanent reminder of how their island was once divided, and a reminder that always makes them smile. Wow Kathy - that really is quite fascinating - most of us I guess do not even think about that wilderness, so thanks for enlightening us! This web page is served on 19 April 2019 at 23:32:02.